Product prices and availability are accurate as of 2019-04-14 03:28:28 EDT and are subject to change. Any price and availability information displayed on http://www.amazon.com/ at the time of purchase will apply to the purchase of this product. Version 6 adds audio recording and editing into Reason, along with Propellerhead's acclaimed mixing console with masterfully modeled EQ and dynamics on every channel, multiple parallel racks, all the effects you know and love plus new ones to fall in love with, and much more of what you've always wanted in Reason - The mixing desk adds a big studio signal chain to all your sound sources. Every audio and instruments track has its own channel strip with built-in EQ, dynamics and advanced routing. A "radio ready" master bus compressor is also available. The Echo is an advanced stereo echo bringing together the brilliance of modern delays with the organic sounds of analog circuitry and old-school tape machines. The Echo is equal parts pristine stereo delay, sound sculpturing toolbox, and playable performance effect. 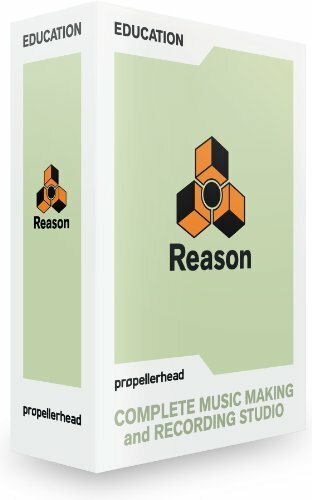 - New in the Reason rack is the Neptune pitch correction and voice synth device. Neptune offers standard pitch correction effects - or you can play new harmonies on your MIDI keyboard for instant backing vocals. Alligator is a three channel pattern-based gate effect that is designed to turn bland pads into rhythmic textures, radically twist your loops, and 'tweak boring beats into blockrocking breaks'. With its three parallel filters, distortion, phaser and delay, Alligator can add rhythm and accents to a flat synth sound, change the feel of a percussion loop, or be a powerful remixing tool. Add it as an insert effect on a single track to change the rhythmic feel of the sound or apply it to the whole mix for a breakdown section to completely reshape your song.